"I will always be a Knick. I will always be a New Yorker." A couple of my best friends are from Tennessee, and our politics are similar, but we had a difference of opinion when it came to the 2000 Democratic Presidential primary. They were die-hard Gore loyalists, and found my support of Bill Bradley inexplicable, the stuff of sabotage. Was it that I wanted a candidate not so closely identified with Bill Clinton and his personal travails? Was it Bradley's emphasis on trade, on health care, his experience with tax policy? Was it what they suggested was my inherent bias toward the Northeast? No, it was none of the above. It was simply this: on the most pressing issue of the time, Senator Bradley had a wealth of experience that Vice President Gore could not hope to rival. That issue, of course, was the Knicks' continuing inability to rebound, and their dire need for ball-handling help in the backcourt. 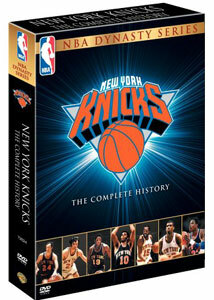 Disc 1, side A starts with an intro from Walt "Clyde" Frazier, and the centerpiece is New York's Game: A History of the Knicks (01h:03m:01s), loaded with interviews with players and announcers, and lots of old game footage. Picking up the baton where this one leaves off is 1999-2005: A New Era of Knicks Excellence (19m:06s), a title that rings true only if you define "excellence" as signing limited, untradable players to insane contracts eating up all your room under the salary cap. There are interviews here with those from the last glory years, including Pat Riley, Patrick Ewing, John Starks, and Anthony Mason. There are brief profiles of nine legendary Knicks: Dave DeBusschere, Jerry Lucas, Willis Reed, Bradley, Frazier, Earl Monroe, Bernard King, Patrick Ewing and Stephon Marbury. (The last perhaps a legend only in his own mind.) Two pieces look at Knicks rivalries: the first (07m:17s) is on the Knicks and the Heat (the Riley apostasy still stings), the second on Bernard King versus Thomas. There's also a section called The Tradition and Heritage, offering ten short pieces, ranging from a look at the 1985 draft lottery which ensured that Ewing would be a Knick, to a visit with very public Knicks fan Spike Lee, to the definition of Knickerbocker. Flip over for a look at five Knicks' seasons, each running about 30 minutes. The earliest is 1960-61, and then come the glory years: the championship season of 1969-70; the followup year of 1970-71; and the second title, 1972-73. The last is a look at the 1999 playoff run; curiously missing is 1994, when the Knicks met Houston in the NBA finals. Each of the remaining four discs holds two complete games from the archives. Disc 2 features Game 7 of the 1970 NBA finals, with Willis Reed's legendary heroism; flip it over for a 1984 playoff win over Detroit, with the most hated man in basketball, Bill Lambier. Disc 3 has a 1984 win over the Celtics, with Bernard King going off for 44; then a 1989 first-round playoff victory over Philadelphia. Disc 4: only Michael Jordan's temporary retirement allows the Knicks to get past the Bulls, and here you can check out Game 2 of the 1993 conference finals (which the Knicks lost) and Game 7 of the rematch the next year. Disc 5 features two 1999 playoff games: first Jeff Van Gundy works out his issues with his mentor when the Knicks beat Riley's Heat in the first round, and then Grandmama, Larry Johnson, leads the Knicks past the Pacers. Of course what's not here are some legendary Knicks losses: Reggie Miller torching them in the Garden in the fourth quarter, or the 1994 NBA Finals game so rudely interrupted by the O.J. Simpson Bronco chase. These old broadcasts are a look at how fashions change, as well�the shorts get longer and longer as the set goes on, and the broadcast technology more sophisticated. It's a set that will leave a Knicks fan angry at our current team, which seems as if it will be very bad for a very long time. But that's the magic of DVD, yes? When you choose the disc, your team always wins. See you at the Garden. Image Transfer Review: The old broadcasts feature a grab bag of video quality, but they've all been adequately transferred. Audio Transfer Review: Lots of static in the old broadcasts; it would be shocking if there weren't. Extras Review: The discs are crammed into a case, and lie on top of one another; the fact that they're all double-sided creates the possibility for all kinds of scratching. The case is nicely festooned with an old team photo, though. A thorough look back at the glory days of a franchise currently on hard times. For diehard Knicks fans and ESPN Classic watchers only.